Enjoy the classy, simple design of the Camden Town Console Table in your living and entertaining space. 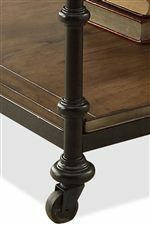 Constructed of Mindy solids and veneer, it features turned metal legs with small bun feet that add a contemporary accent. A Hampton Road Ash finish provides beautiful, light brown tones to match your decor. A rectangular table top provides plenty of space for setting your television, while two open shelves below offer additional room for modern media components. 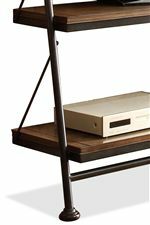 Easily set your DVD/Blu-Ray player, gaming device, or stereo system on each shelf. 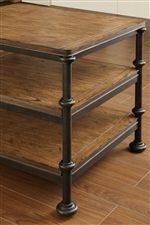 This piece can also be used as a sofa table for displaying home accents and decor.The Camden Town Console Table is a truly refreshing piece to outfit the living room in your home. The Camden Town Rectangular Console Table with 2 Shelves by Riverside Furniture at AHFA in the area. Product availability may vary. Contact us for the most current availability on this product.